From the airport in Guangzhou, the taxi takes me to a large hotel in Foshan City where I am met by Alan FENG and his Master CHEN Zhi Jiu. Master CHEN gives me a perfectly amazing ceramic sculpture of a robed man laughing, his bearded chin poking out. They show me the artisan’s chop on the inside. Possibly a national treasure. I give him a bottle of Jose Cuervo gold tequila I’ve been carrying in my bag for this occasion. Caption to image above: Master CHEN's collection room. This was the beginning of a two-day tour of penjing in Foshan City. 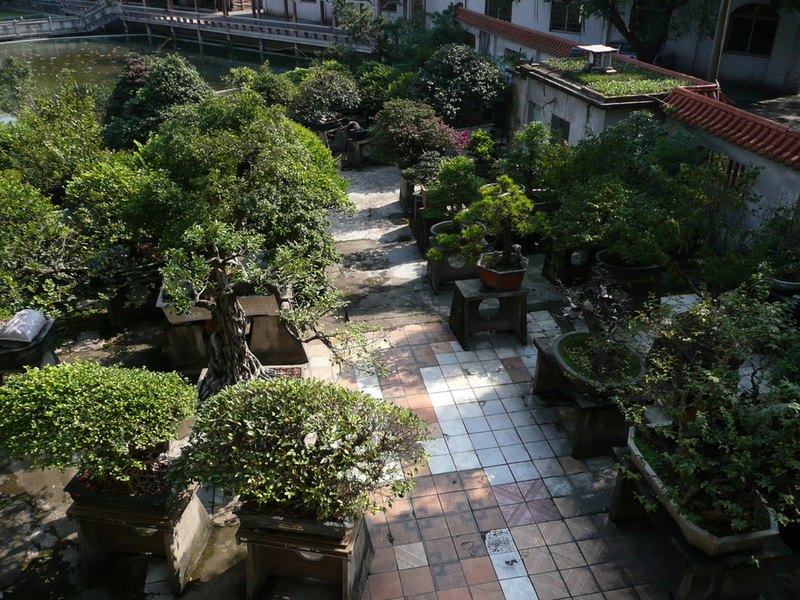 After morning tea with dim sum and small, delicious things, Master CHEN drives the three of us to his private penjing garden in town, the Qing Wan Garden. He founded the garden with his older brother in 1999. Alan is accompanying us everywhere as Master CHEN’s student and translator. The garden entry displays the government plaque designating it as a formal penjing garden. Inside the first building are Master CHEN’s calligraphy, rock and root penjing, ceramics and book collections. His garden assistant, Ms. Ling, meets us here with cups of hot tea. Lingnan style 岭南岭南 is named for a region south of the five mountain ranges. It is an old term for south China, especially for Guandong province where Foshan City is located. Not only is the area famous for their penjing trees but also for their high grade ceramics production that dates back to before 600CE at the time of the Jin Dynasty. Traditional Lingnan style uses no wire, although the artisans can use weights to pull down the branches. Since culture exchange with Taiwan started in the 1980s, Lingnan craftsmen are using more aluminum wire to bend and shape branches. Accent plants and small figurines are traditional elements of penjing. The accent plant is called ying. Typical Lingnan ceramics styles include: a white crackle glaze, a blue drip glaze, a red color with characters or designs in emblems. The dishes or bowls can be very large to accommodate the large trees, another characteristic of penjing. Exhibition is taken very seriously here. Major exhibitions are held twice a year in Foshan City, in May and in October. Depending on the tree variety, grooming prior to exhibition begins fifty to thirty to ten days before the exhibition date, fifty for the tea tree and thirty for the Chinese black pine Ma wei shong. Master Chen CHEN Zhi Jiu, 57, Peoples Liberation Army from 1974 to 1984, fought in Chinese war with Viet Nam (1979-1989) as Commander of 100 men of a cannon brigade 高射炮 gāoshèpào. 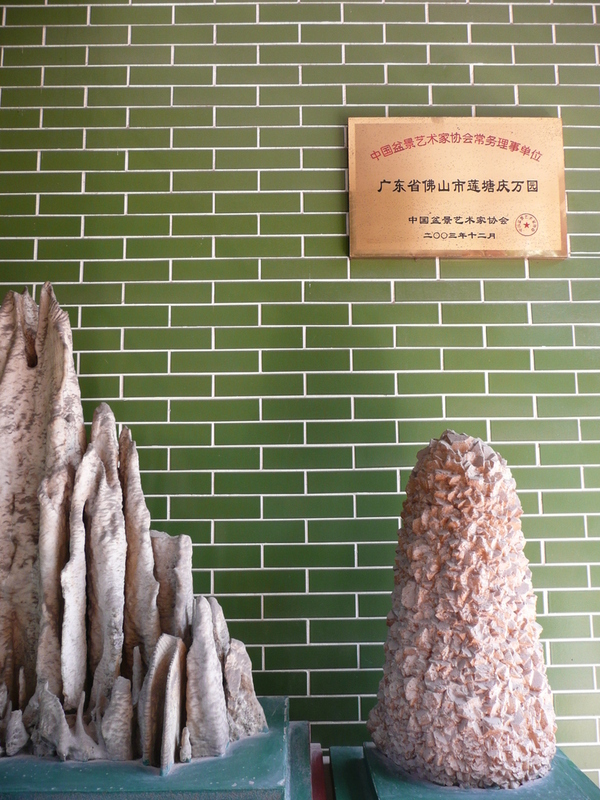 In 2003, he sold his ceramic factory and purchased a rare earth factory. Master Chen started propagating plants at a young age. He wanted to help his grandmother who was suffering from cancer by growing medicinal herb 艾草 àicǎo Asian mugwort, and his Father was a fish farmer. 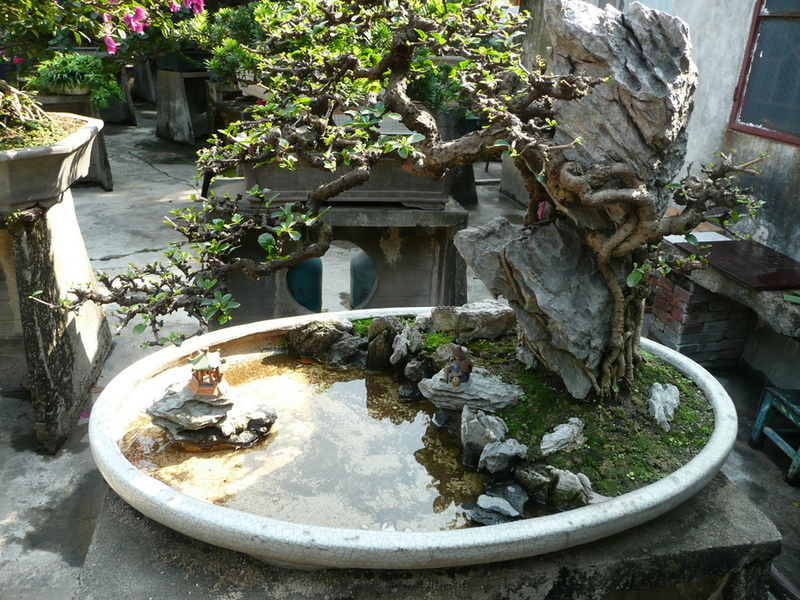 Lingnan tree styles include the Water and Land style, which incorporates a water feature, rocks and plants in a shallow Lingnan ceramic pot, often with miniature elements like a house, bridge, animal or human figure. Ficus is used frequently in this temperate to tropical region and is suitable for Raft style, also called Rainy or Rain Forest style. Tea tree or Fujian tea is used primarily in the Mountain style which is a cascade mimicking the way the tea tree in nature clings to the side of a mountain with exposed, gnarled roots. The large Lingnan pots provide higher moisture content to the soil medium than the smaller size containers we are accustomed to seeing in the West. They can be grown for a long time in the larger pot before grooming for exhibition.